I have a fun new baby sweater pattern to share with you today! 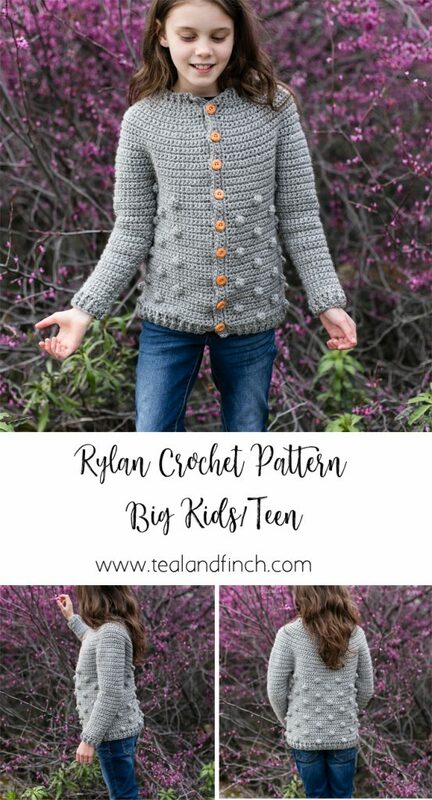 The Rylan cardigan is the cutest new crochet pattern for boys and girls 3 months to 6 years. 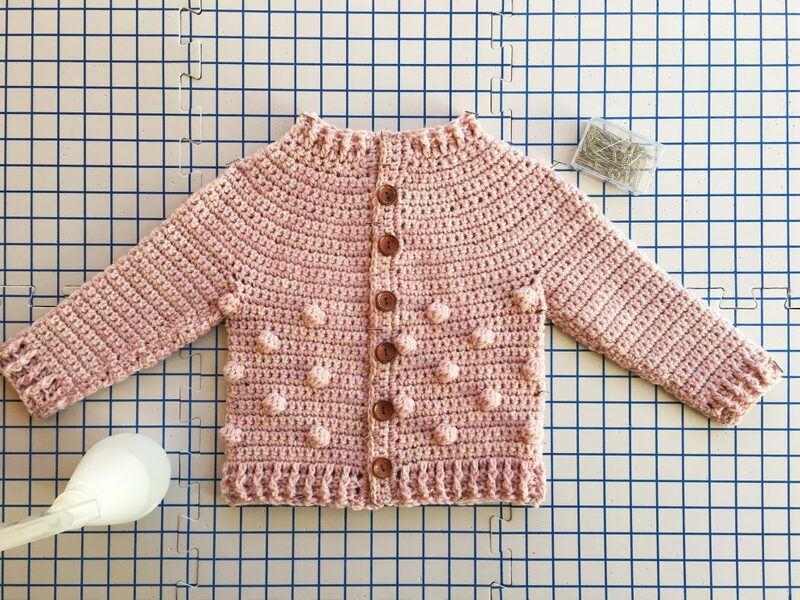 I wanted to design a sweater that could be your go-to pattern for baby showers, birthdays, any type of gift giving, really! 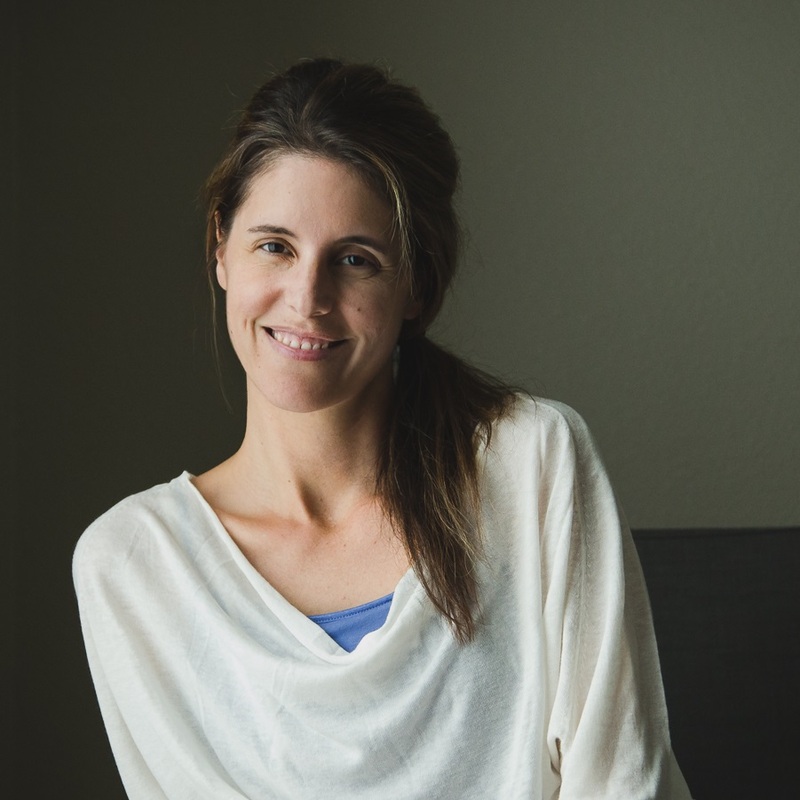 I love it on girls and boys, it has a great structure to it and is perfect for any season. I also made a full length video tutorial for you! 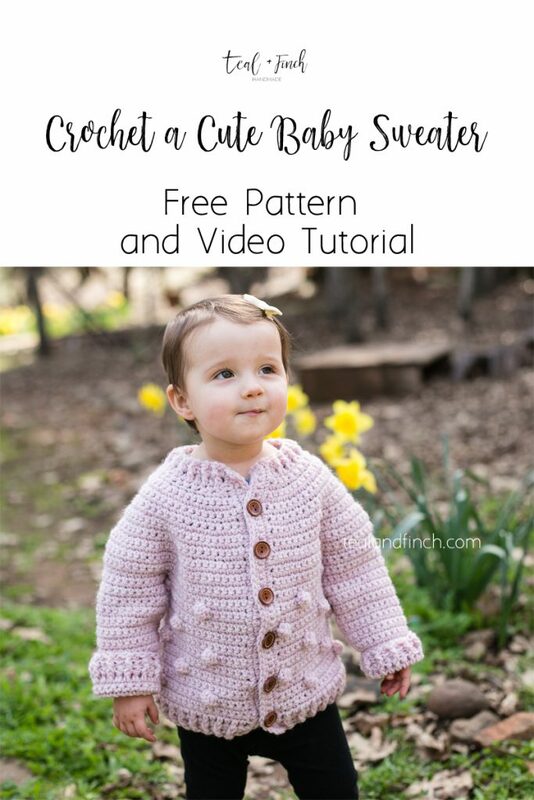 If you are just learning how to crochet and have made a few other projects, I think this sweater would be a great next step for you. It is really pretty simple and straightforward. Plus, it’s a baby sweater, so it goes pretty quickly! The trickiest part for some people (alright, me!) to learn is how the sleeve separation works. Seeing the written pattern for a sleeve separation can be confusing if you’ve never heard of it before. But once you see it on the video, it is super easy. 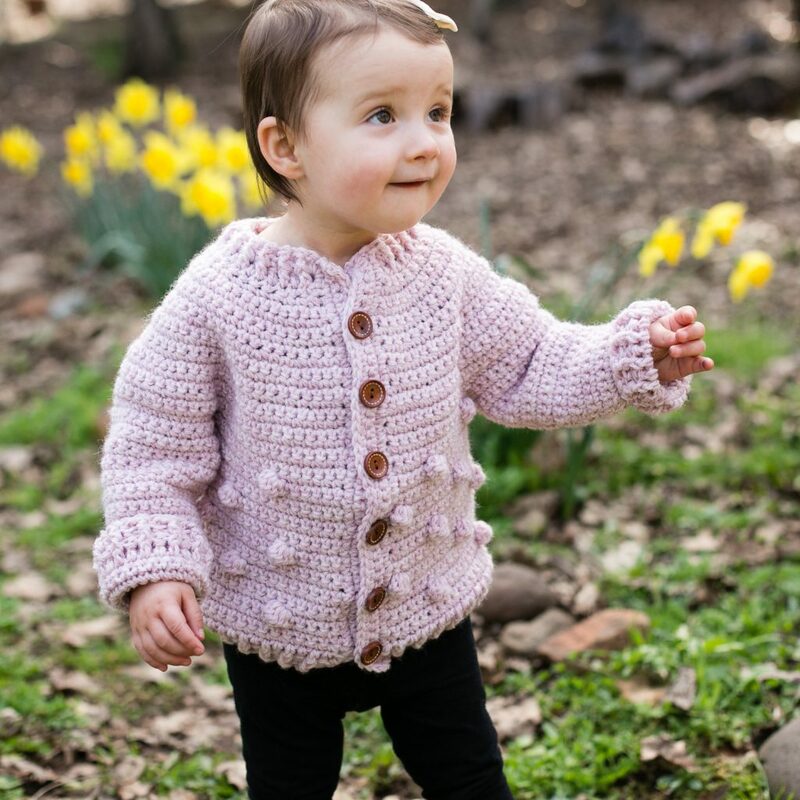 General Instructions: This modern baby sweater is worked from the top down in rows. Simple increases are used to create the yoke, followed by a sleeve separation. 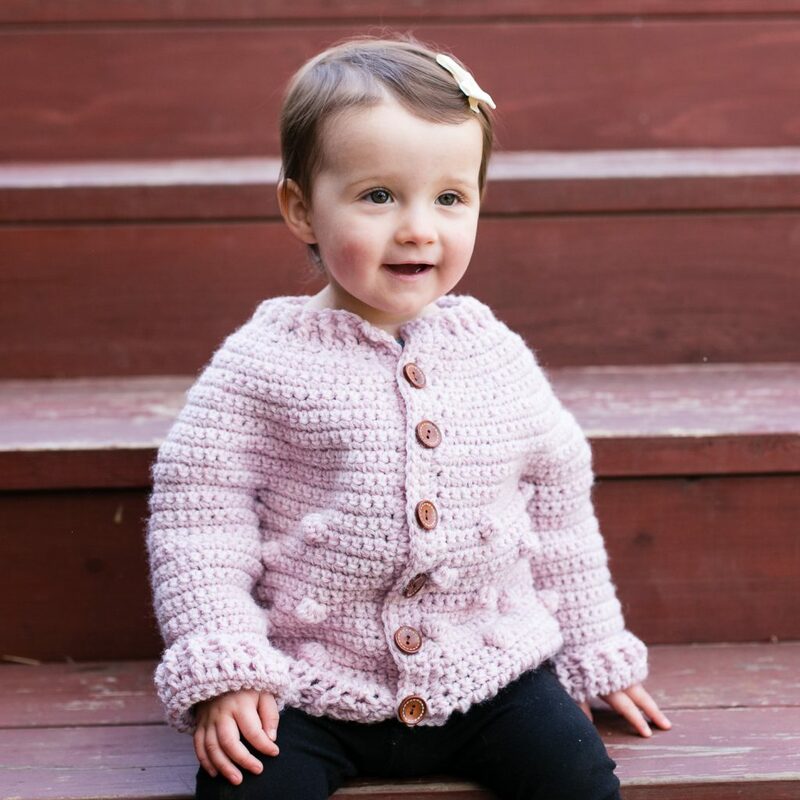 The body features the cute bobble stitches that make this sweater unique. Ribbing and button bands are added next. Finally, the sleeves are worked flat and seamed at the end. 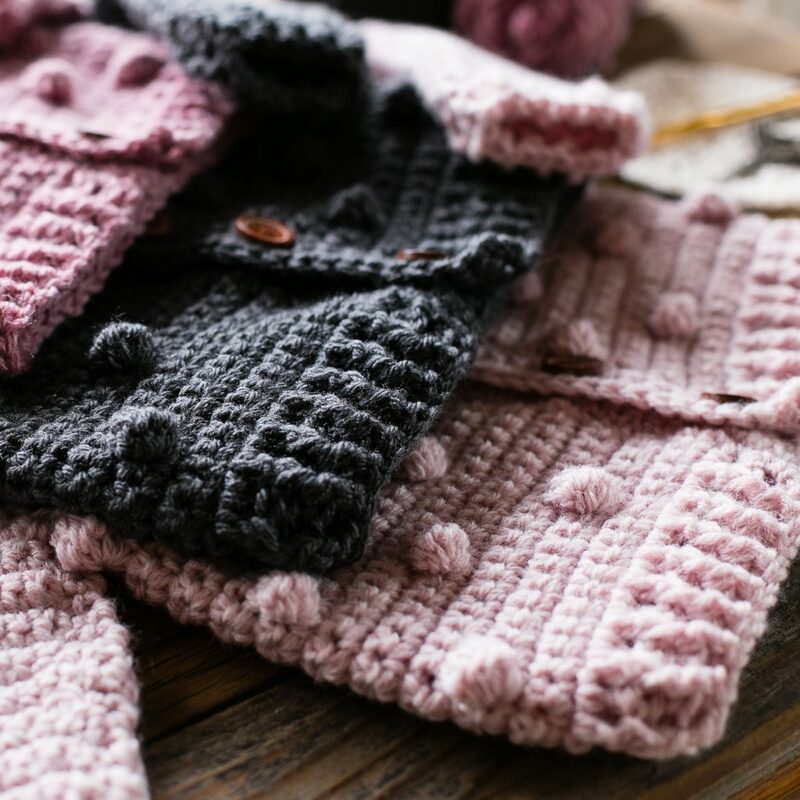 Supplies: J/10 (6mm) crochet hook (or size needed to obtain gauge), 3/4” buttons (5-7), ruler, tapestry needle, sewing needle and matching thread for buttons. 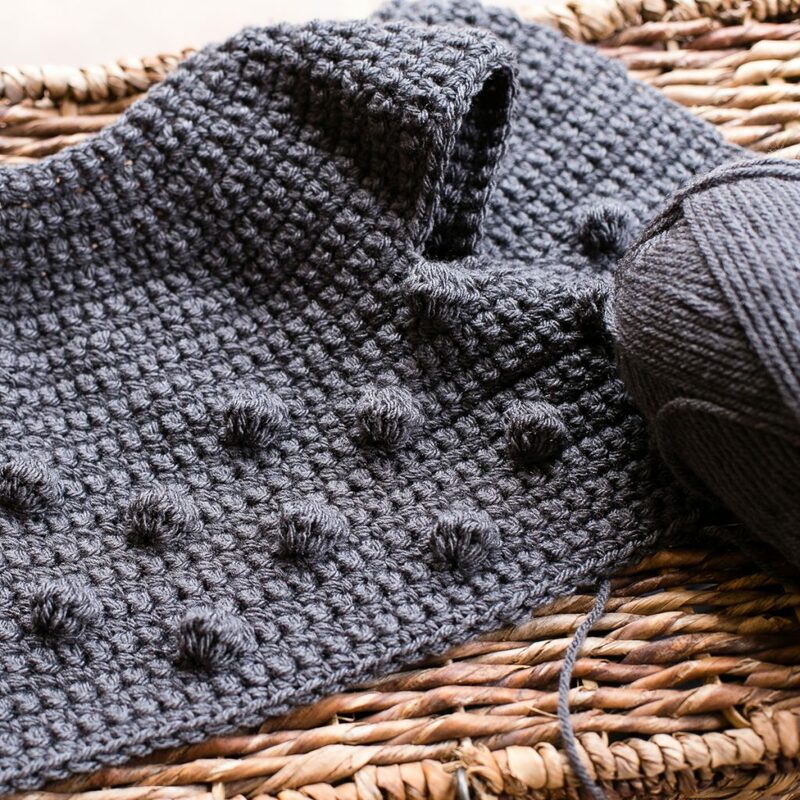 For accurate sizing, make a gauge swatch before you begin your sweater. Row 2: Ch 1, sc in ea st, turn. Repeat row 2 until you reach a total of 14 rows (including row 1). Swatch should measure approximately 4” across and 4” down. If swatch is too small, try again with a larger hook. 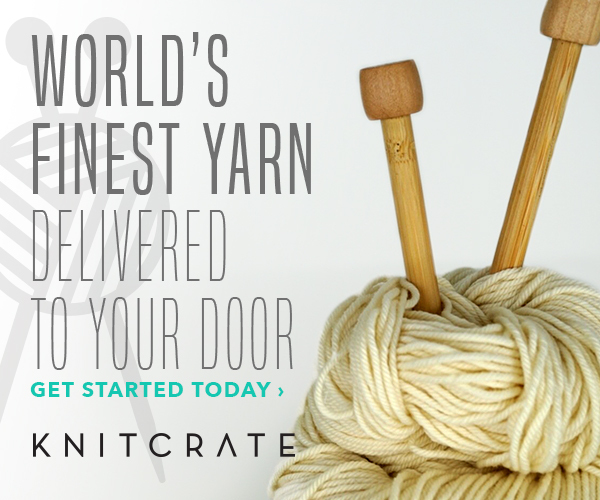 If swatch is too big, try again with a smaller hook. To find the right size, measure child’s chest and add 3”. Make the size with the finished circumference closest to this number. Suggestion: Before you begin, read through the pattern and circle your size throughout. 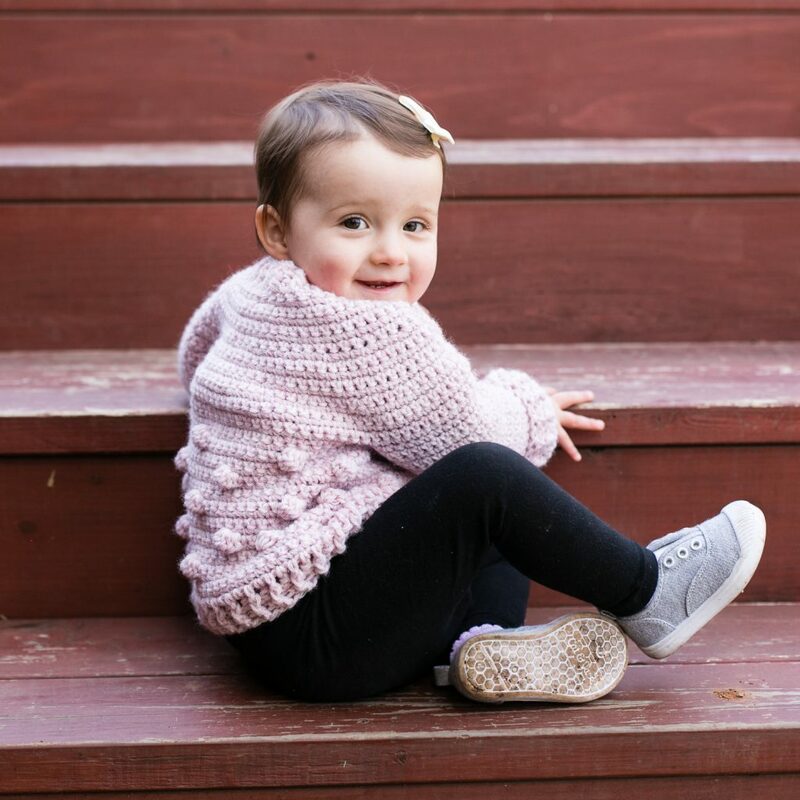 The model is wearing size 2T and the sweater was a little big on her (she normally wears 18 months). New! 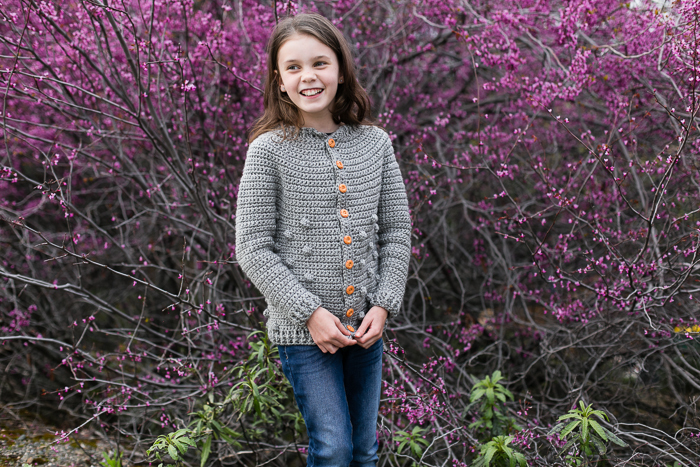 The Rylan Cardigan pattern is now available in sizes 8-16 for free as well! See the blog post for big kids and teens. Ch 1 at the beginning of a row does not count in stitch count. Turn at the end of each row. When measuring yoke height, lay sweater flat so it forms a semi-circle. Find the approximate back center (back neck) of the sweater and measure straight down. Do not measure the edge of the work. Row 2: ch 1, sc in each sc. First increase: ch 1, *sc, inc; rep from * to end of row.54 (60, 63, 66, 72, 78) stsSc as many rows as needed until yoke height measures 1.5 (1.75, 2, 2.25, 2.5, 2.75) inches, ending with an even number of rows. Sc as many rows as needed until yoke height measures 2.75 (3, 3.25, 3.5, 3.75, 4) inches, ending with an even number of rows. Sc as many rows as needed until yoke height measures 4.25 (4.5, 4.75, 5, 5.25, 5.75) inches, ending with an even number of rows. 14 (15, 16, 17, 18, 19) sc. Do not tie off. We will now be working the body only, saving the sleeves for later. Row 1: Ch 1, sc in each sc and in each ch st. 60 (66, 69, 72, 78, 84) sc. Row 2: Ch 1, 0 (3, 4, 1, 4, 2) sc, *4sc, bobble, 5sc; rep from * until 0 (3, 5, 1, 4, 2) sts remain, sc in remaining sts. Rows 3-5: ch 1, sc in each st. Rows 7-9: ch 1, sc in each st.
Repeat rows 2-9 until total sweater height (including yoke) reaches 8 (9, 9.5, 10, 10.5, 11.5) inches. Do not tie off. Row 1: ch 2, sk 1st sc, dc in each st across, turn. Rows 2-3: ch 2, sk 1dc, *fpdc, bpdc; rep from * across, dc in top of ch 2. Row 2: ch 2, sk 1dc, fpdc, *bpdc, fpdc; rep from * across, dc in top of ch 2. Row 3: ch 2, sk 1dc, bpdc, *fpdc, bpdc; rep from * across, dc in top of ch 2. Neck Ribbing: Tie slip knot on hook and insert hook in top corner of sweater. Sl st and work same as row 1 of hem ribbing, working in each ch st across the neck of the sweater: Work row 2 same as hem ribbing (don’t do row 3). Tie off. Weave in loose ends. Tie slip knot on hook and insert hook in bottom (top for left-handed crocheters) corner of sweater. Row 1: Sc in the end of each row up the side of the sweater, turn. Rows 2-3: Ch 1, sc in each sc to end of row, turn. Tie off. Weave in loose ends. Tie slip knot on hook and insert hook in top (bottom for left-handed crocheters) corner of sweater. Row 1: Sc in the end of each row down the side of the sweater, turn. Row 2: Ch 1, 3sc, *ch 1, sk 1, 6 sc; rep from * as many times as you can until not enough sts remain, sc in remaining sts, turn. Row 3: Ch 1, sc in each sc and 1sc in each ch 1 sp, turn. Tie off. Weave in loose ends. Sew buttons on button band opposite each ch space. Note: Continue to turn at the end of each row. Tie slip knot onto hook and join yarn to armpit of sleeve in the center of the ch sts. Sc as many rows as needed until sleeve length reaches 1.5 (2, 2.5, 3, 3.5, 3.75) inches. Sc as many rows as needed until sleeve length reaches 2.5 (3, 3.5, 4, 4.5, 4.75) inches. Sc as many rows as needed until sleeve length reaches 4.5 (5, 4.5, 5, 5.5, 5.75) inches. 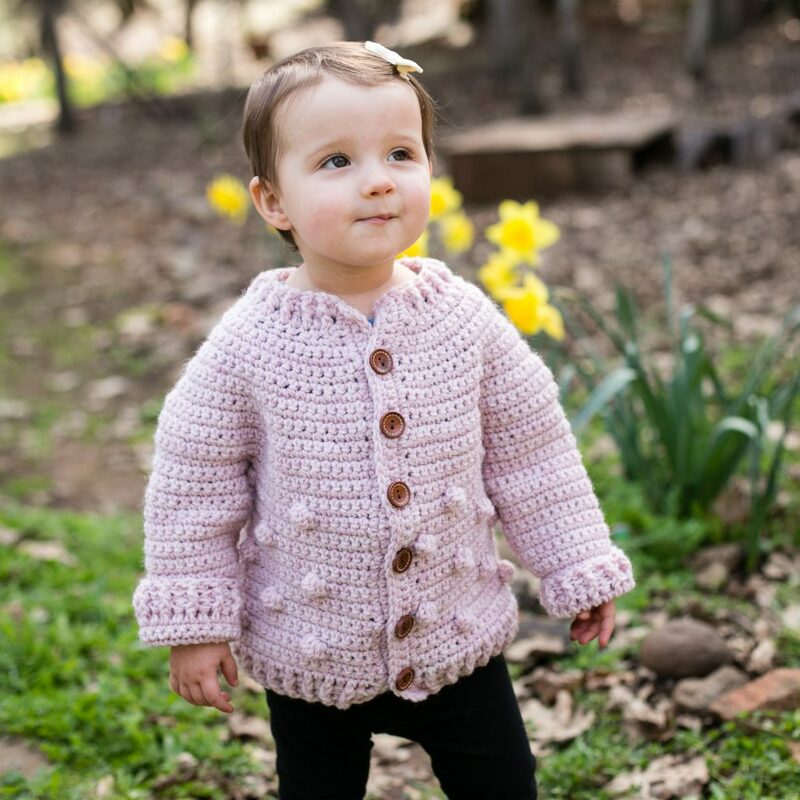 For sizes 3/6 and 12 months, stop here and begin ribbing. Sc as many rows as needed until sleeve length reaches 4.5 (5, 6, 6.5, 7, 7.5) inches. For all sizes except 6, stop here and begin ribbing. Sc as many rows as needed until sleeve length reaches 4.5 (5, 6, 6.5, 7, 9) inches. Row 1: ch 2, sk 1dc, dc in each st, turn. Row 2: ch 2, sk 1dc, *fpdc, bpdc; rep from * across, dc in top of ch 2. Size 18 mos only: repeat row 2. Row 3 for all sizes except 18 mos: ch 2, sk 1dc, *bpdc, fpdc; rep from * across, dc in top of ch 2. Tie off, leaving a long tail for seaming. Join sleeve seam with tapestry needle and whip or ladder stitch. Tie off, weave in loose ends. 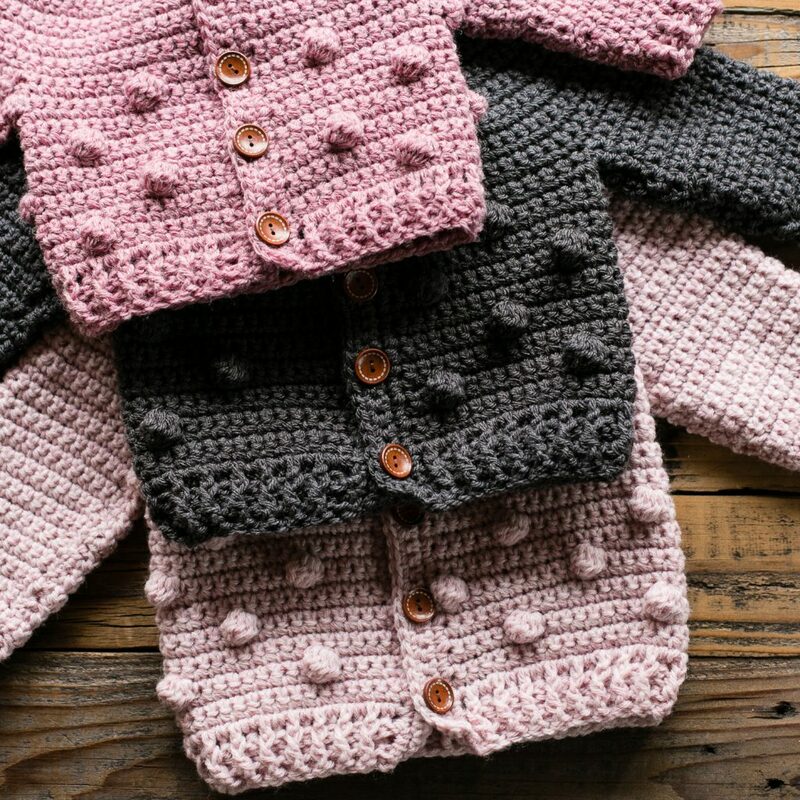 Blocking is a great way to give your sweater a more refined appearance, great for gift giving! Spray sweater with water until it is slightly damp. 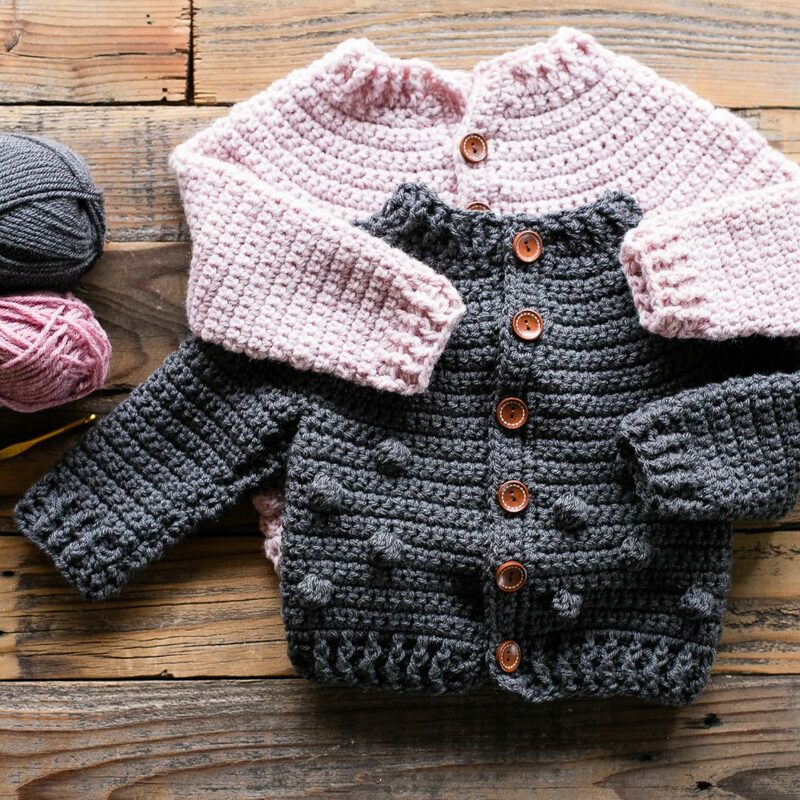 Lay flat on a blocking board or other soft surface and gently stretch sweater slightly (about ½ inch in every direction). Pin in place as you stretch. Blocking boards and T pins work great for this but if you don’t have those, you can use several layers of towels and regular sewing pins. Now available in sizes 8-16 for free on my blog! 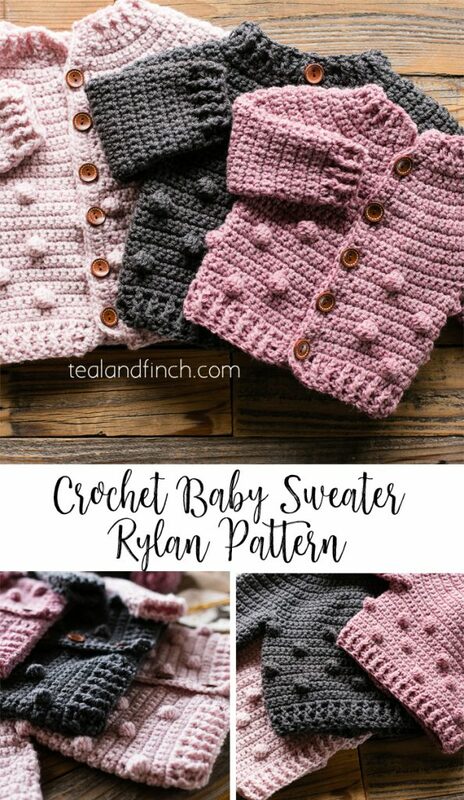 Share on Instagram @tealandfinch with #rylansweater.